Pemba Island lies about 55 miles to the northeast of Zanzibar Island (Unguja), which is about a 30-minute flight away from Stone Town airport. Although broadly comparable in size to Zanzibar, Pemba is much less developed. Pot-holed roads lead through villages where women in bright kangas sit and chat, ox-drawn carts are stacked high with fruit, and the air is filled with the smell of spices. Pemba is very fertile, and always seems greener and more arable than Zanzibar Island. It also produces far more cloves than Zanzibar – and its economy is still far more dependent on agriculture than Zanzibar, and far less dependent on tourism. Pemba is one of the most densely populated areas of Tanzania, with most of the people living in fairly traditionally-designed square houses, built using mud walls around a wooden frame and with roofs of thatch or corrugated iron. Pemba’s main town, and the island’s administrative capital, is Chake Chake – and that’s where the island’s airport is. Pemba’s inhabitants are predominantly Muslim. 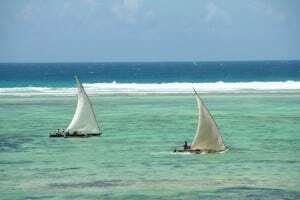 It has a culture that is even more traditional than Zanzibar, and the island gets far less visitors – and hence sees less of the outside world. Thus expect to see Pemba’s women wearing the veil, and few villagers who speak anything other than Swahili.